It’s not the stuff of science fiction. If all goes according to plan, The Seton Keough High School in Southwest Baltimore could soon benefit from solar energy produced nearly 30 miles away on an archdiocesan-owned farm in Sykesville. Coming on the heels of the recent installation of more than 3,000 energy-efficient lightbulbs on the 183,000-square foot campus and a coming community partnership to make use of a state-of-the-art artificial-turf sports field, the move is just another example of the all-girls school’s commitment to environmentalism. The solar field is being developed through a partnership between the Archdiocese of Baltimore and Constellation Energy. William Baird III, executive director of the archdiocesan Department of Management Services, said a memorandum of understanding has been reached that is awaiting regulatory approval. If given the go-ahead, the archdiocese will lease a 30-acre farm in Carroll County to Constellation, which would erect state-of-the-art solar panels and infrastructure to maintain it. 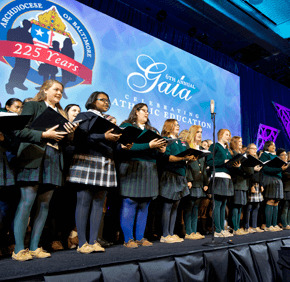 The archdiocese would then purchase the energy that’s produced – benefitting Seton Keough and several other Catholic institutions as early as the beginning of 2016. “The solar field would literally power eight to 10 locations,” Baird said, noting that the Cathedral of Mary Our Queen and the School of the Cathedral in Homeland; the Basilica of the National Shrine of the Assumption of the Blessed Virgin Mary in Baltimore; the Catholic Center in Baltimore; Archbishop Curley High School in Baltimore and Archbishop Spalding High School in Severn are among others to benefit from the partnership. Bridickas said the solar arrangement is expected to result in significant cost-savings for her school. Seton Keough is already enjoying savings of “a couple hundred dollars” every month from the installation of new light bulbs, she said. The new lighting was installed in December at the Seton Keough campus, which also shares space with Holy Angels Catholic School and participants in Operation TEACH. The $136,290 cost of updating the lighting was covered by BGE, working through the BGE Smart Energy Savers program. Several other Catholic schools are also participating. The president said Seton Keough is eagerly awaiting the development of nearby Gibbons Commons, a 32-acre mixed-use project of St. Agnes Hospital at the site of the closed Cardinal Gibbons High School. Seton Keough is expected to make use of a sports complex being developed by St. Agnes and the Cal Ripken Sr. Foundation that will include an artificial-turf field. Seton Keough’s softball, lacrosse, field hockey and soccer teams hope to use the field for games and possibly some practices. Other components of Gibbons Commons include enhanced green space, community services and recreational facilities. New community-based housing is also being developed by Bon Secours Baltimore Health System and Enterprise Homes. Kirstan Cecil, director of marketing and communications at St. Agnes Hospital, said in a written statement that St. Agnes and Gibbons Commons partners will host a groundbreaking event in May, at which an update on the project will be given and new details unveiled. Bridickas noted that her 220-student school tries to incorporate environmental awareness in the curriculum, and offers an environmental science course. Recycling is integrated throughout the campus. Pope to visit Cuba before heading to U.S.